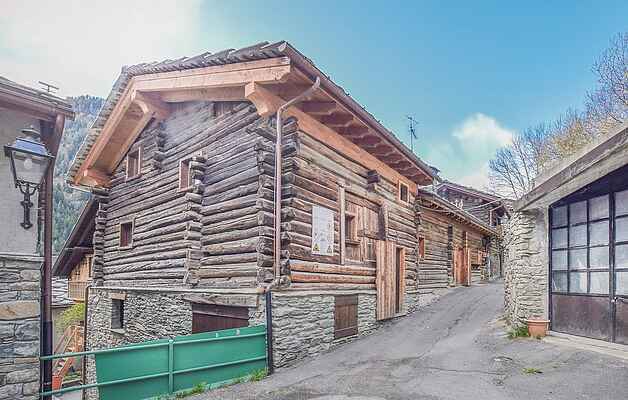 In a historic village in the hamlet of Brusson, a municipality in the Valle d'Ayas, there is this three-level holiday apartment located in a row of old houses, ideal for your unforgettable mountain vacation, both in winter and in summer. If you love winter sports, this is the right place for you! In Champoluc (10 km) you will find the ski lifts of the Monte Rosa Sky area which, in addition to 180 km of slopes, offer the possibility of practicing heli-skiing, climbing ice falls, guided snowshoe tours, ski mountaineering and summer ski, down hill. Other famous ski areas from which you can choose are Gressoney (56 km) and Cervinia (57 km). The location is also ideal for your summer holidays, in fact there are many paths that trekking lovers can follow to discover the beauty of the valley. Do not miss a trip to the Gran Paradiso National Park (75 km), where, during your excursions in contact with nature, you could meet the local fauna, a unique experience to capture with beautiful photos. A holiday in the Aosta Valley will allow you to discover also its rich art and culture. In Aosta (57 km) there will be numerous Roman monuments, including the Arch of Augustus and the beautiful Roman Theater, to fascinate you. For a historical tour we recommend a visit to the castles of Fenis (41 km), Issogne (18 km) and Verres (16 km). Do not miss the opportunity to delight your palate by tasting some traditional culinary specialties (Lardo di Arnad, Fontina, soups and polenta). At 22 km is Saint Vincent with its famous thermal baths and at 95 km Turin, the first capital of Italy, with its monuments and museums, including the famous Egyptian museum, the Mole Antonelliana with its National Cinema museum, the Basilica of Superga and the Royal Palace of Venaria Reale. At about 100 m from the house there is a private outdoor area. The two bedrooms with sofa beds are located on the first and second floors respectively, both without door (passage room).